Dr. Donald J. Annicelle grew up in Trumbull, CT and graduated from the University of Connecticut in 2003. He attended The University at Buffalo School of Dental Medicine where he graduated in 2007 with a minor in Oral Diagnostic Sciences and a focus on TMJ dysfunction. He continued his education in a 1-year general practice residency at Danbury Hospital, and was working in Fairfield County for 3 years before joining Center Dental Office in December 2010. Dr. Annicelle brings a fresh and modern approach to dentistry, with the same compassion and care that is the standard of Center Dental Office. Dr. Annicelle was the recipient of the Anthony Gugino Humanitarian Award in 2007, and was voted a Connecticut Top Dentist in 2011. 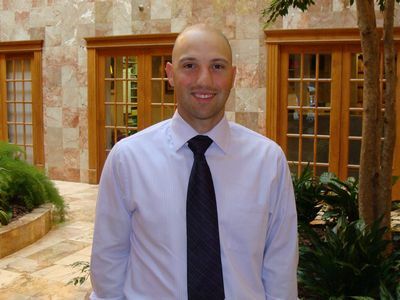 Dr. Annicelle enjoys volunteering his time as a baseball coach in Avon, CT and stays active by playing baseball and golf on the weekends. Dr. Annicelle loves traveling and going for long walks with his beautiful wife Vilma, and also enjoys the company of his friends and family. Dr. Annicelle is a member of the American Dental Association, the Connecticut Dental Association and the Hartford Dental Society.